15-Opening Horizontal Bar Rack is ideal for mixed storage of long items. Five holes high and three holes wide frame allows for easy identification and retrieval of materials. The unit offers 2000 lbs. per level or 7700 lbs. capacity per frame. 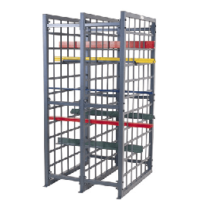 Size: 48″ w. x 48″ D. x 60″ h. Long Bar Pigeon Hole Rack. 15 openings. Wt. : 200 lbs. Part Numbers:LBPH-77 (Starter unit) and LBPH-EXT (Add-on unit). SKU: N/A. Categories: Bar Racks, Storage Products, Warehouse Racks. When one opening is just not enough we have the 15-opening horizontal bar storage rack! This specialty storage rack is the ideal for storing long items of varying lengths. It has three openings wide by five openings high for a total of 15 openings per side. This horizontal bar rack is made of tubular steel and is strong enough to handle 2,000 LBS per level or 7,700 LBS per frame. These unique bar storage racks have been called Pigeon Hole Racks because the holes are small and plentiful. You can imagine a pigeon coming to rest on this rack. Pigeon hole heavy duty pipe racks store bars, rods, tubing and other long materials. 15-opening racks are a heavy duty, stable shelving unit that is fully welded with upright frames and have lateral supports and X-braces.